The UAAP fever for this year is already over but Jollibee is not yet done with it. My beloved and I visited a Jollibee branch for some refreshments and we saw the University Floats on the Jollibee menu. Since my beloved is somewhat addicted to floats, we decided to order two of Jollibee’s University Floats. 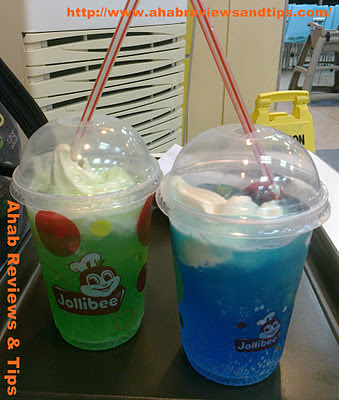 My beloved chose Green Apple float while I chose the Blue Bubblegum. Other University Floats on the Jollibee menu are Red Watermelon and Yellow Dalandan. I know that University Floats are just Sprite soft drinks that were mixed with flavoring and a sundae on top. Green Apple and Blue Bubblegum floats. We rated both flavors of the University Floats as “OK.” This is means that they are not bad but not excellent either. Well, it is good that Jollibee keep on placing new items on the Jollibee menu. Personally, I believe that the Green Apple tastes better than the Blue Bubblegum. We will try the Red Watermelon and the Yellow Dalandan the next time that we visit Jollibee. However, the University Floats may be gone on the Jollibee menu soon since this year’s UAAP is over. If that happens then we will wait until next year for the next batch of University Floats. If there are no University Floats, then there will always be the regular Jollibee float. Visit Before the Eastern Sunset and read about my visit to San Agustin Museum. ^_^ The regular floats are still available.